By Elizabeth F.S. Roberts, originally posted on Somatosphere. 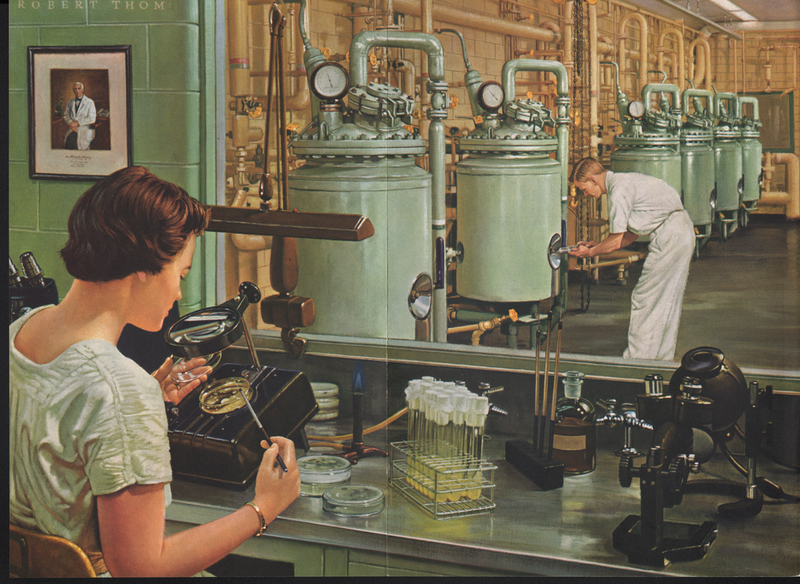 “The Era of Antibiotics” by Robert A. Thom, 1950s. Julius Richard Petri (1852-1921) worked as an assistant for Robert Koch in Berlin at the Imperial Health office. Koch, who identified the microorganisms responsible for cholera, anthrax and tuberculosis, was, along with Pasteur and Lister, one of the late nineteenth century’s “fathers of microbiology,” aka the “fathers of germ theory.” When Petri arrived in Koch’s lab in 1877, lab assistants were using flat glass plates to grow bacteria colonies. They would pour the bacteria along with a gelatin cultivation medium on top of the glass, layer the plates, cover them with a large glass bell jar, and then heat the whole thing to cultivate the colony. [i] This was a cumbersome process, and it made counting bacteria difficult under a microscope, an essential tool for making microorganisms visible. Petri improved the technique: He developed a smaller, round, flat-bottomed double dish with sides. One dish was slightly larger, serving as a lid and a shield. As Petri explained, in his short 1887 paper, “A minor modification of the plating technique of Koch,” “under these conditions, contamination from airborne germs rarely occurs.”[ii] Key to this modification was how Petri made his dish fit under a microscope. It’s not clear how or with whose help Petri manufactured the dish. But we do know another crucial co-innovation – replacing gelatin with agar as a culture medium in the petri dish – came through the help of fellow lab assistant Walter Hesse, and his wife Angelina. Angelina Hesse, who often assisted Walter in the Koch lab, learned about agar (the Malay word for a polysaccharide derived from red algae seaweed) from her Dutch neighbor in New York, who had migrated from Java. Unlike gelatin, agar is heat stable and was able to keep Angelina’s summer jellies stiff. [iii] Part of a larger story about science, domesticity, colonialism and gender too long to tell here, the combination of the dish and the agar made it possible to purify and clone bacterial colonies derived from single cells with the right heat conditions. This, in turn allowed scientists to identify bacteria responsible for disease, under a microscope. The petri dish helped the laboratory scientists see and count something that was new: microorganisms. It was only a few decades earlier that scientists had begun to identify diseases as entities on their own, separated from idiosyncratic environments and human bodies. [iv] The petri dish helped grow microbiology and the relatively new “germ theory” of disease. 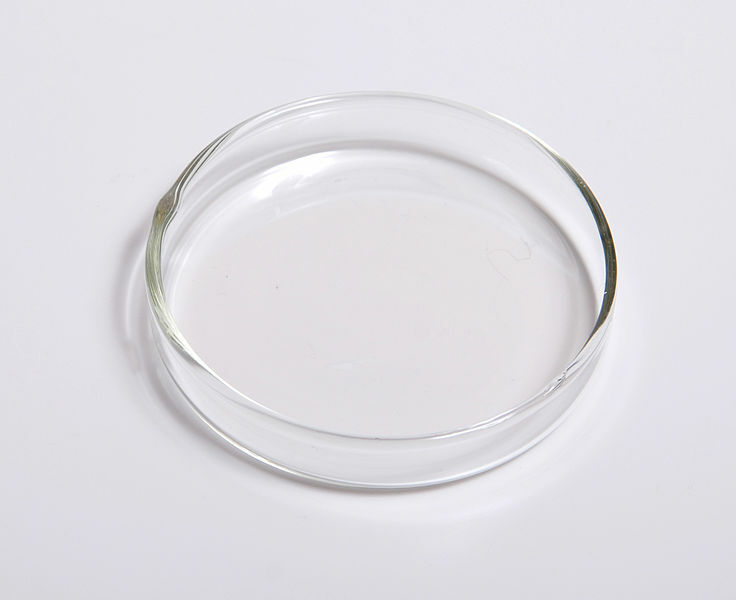 Petri dishes are also called cell-culture dishes. This use of “culture” harkens back to the cultivation of agriculture and animal husbandry of the 16th century, which was extended to the process of human development and eventually linked by philosophers, like Johann Gottfried Herder, to people marinating in particular conditions of place, language, spirit and tradition. This culture was not opposed to nature, as it came to be later on, but rather was part of the material processes of an organism’s development. The petri dish’s ability to culture bacteria and keep out contaminates was thus both old and new: Old because culturing bacteria developed organisms shaped by the entangled conditions of the culture medium surrounding them; new because the promise of the demarcated boundaries of a controlled experiment using a petri dish posited a world where separation between organisms and environment was possible. Arguably, this new ability to separate organism and environment within germ theory and petri dishes came bundled with new kinds of persons – individuals who became stable, separate entities, bounded and impervious to the outside world. In other words, within the late nineteenth century, new kinds of inviolable and discrete entities were born: both the individuated microorganisms of the germ theory of disease, and autonomous, individual people. The processes involved in generating those individuals were undergoing related transformations as well. The germ line of the late nineteenth century, like genes that came later, formed the basis for a “particulate theory of inheritance.” This theory was understood as the generational passing of discrete particles which were not affected by life circumstances. [v] Germ plasm became part of emergent models that placed reproductive processes solely inside the body, instead of an older Lamarkian generation concerned with how acquired characteristics could be passed generationally and how “maternal impressions” coming from outside a mother’s womb could affect the conceptus within. The germ line limited the number of “actors” involved to the germ plasm of an individual man and an individual woman. The womb was rendered superfluous to how children turned out, and women became passive vessels of the future. With the later development of assisted reproduction, petri dishes were also assumed to be inert; holding, but not shaping their reproductive contents. In-vitro fertilization (IVF) brought us the ubiquitous image of the “test tube baby,” but as anyone with a passing familiarity with techniques of assisted reproduction knows, the more accurate image would be a “petri dish baby.” When IVF was first developed, both process and petri dish exemplified particulate inheritance. Reproductive cells were taken from individual women and men’s bodies, and were placed in a petri dish with cultivation mediums in the hopes of making an embryo. The cells were then transferred back into a woman’s body. Any resulting child was a combination of only these particulate gametes. The petri dish, like a woman’s womb, did nothing. This is partly a story of chemical materials. Glass or plastic? Petri’s actual dishes were made out of glass, which is less permeable than plastic. After each use they were washed sterilized and reused. Glass was what was available and labor to make it was cheaper. Thus originally, the petri dish’s ability to separate organism from environment was stronger. Petri and Koch were, in fact, keeping more of the world out. But in-vitro fertilization – which literally means “in glass” fertilization – has almost always occurred in plastic. Plastic’s promise – derived from the bio-industrial processes that offered manipulability, separation, and disposability, world without end …Amen – might be waning. Findings about plastic’s permeability inhabit a contemporary world also preoccupied with concerns about the permeability of the “maternal environment” on the developing fetus and the effects of plastics on organisms. Within reproductive processes, plastic petri dishes and wombs no longer passively contain the eggs and sperm while they engage in their dyadic, particulate combining. Instead, gametes are mingled within everything that contains and constitutes them. These concerns about plastic petri dishes and permeable wombs relate again to the broader constitution of persons who are becoming less and less particulate. Witness the fraying of the industrialized, first-world sense of the impervious individual gene, germ and person of the late 19th and 20th centuries. Individual genes no longer determine us. Complex and variable epigenetic mechanisms trigged by external conditions shape us. We are awash in microbes. [viii] Guts are us. [ix] Nature and culture contaminate each other. Nature and culture dissolve into each other. We exist through environments that seem to be crumbling as forms of social welfare like education, health care, social security and public works are undercut and privatized. I think of those entities as part of the “infrastructures of individualism,” the unseen endoskeleton of support that allows first-worlders a feeling of independence from the other people, germs and chemicals around them. [x] That was a world where petrochemical plastics made sense. Petri dishes have been a useful way to keep a few things in and most things out. They still are, but not to the same degree as it becomes increasingly evident that separations are hard to make. The black box of the petri dish is opening…. but to what? Maybe to an expanded sense of contaminates, where contamination prevention is impossible, since entanglement is existence. Isolating entities and controlling for all variables might no longer be the goal, as both the biological and social sciences model a more Lamarkian, dare we say Herderian world, where “to be is to be related.”[xi] Instead, we might need processes that ask: How and when do things relate? To what degree? And to what effect? Surely, petri dishes, with their chemical composition now noted, will be part of that work. [i] Christopher Intagliata. “Science Diction: The Origin of the Petri Dish, Science Friday.” http://www.sciencefriday.com/segment/12/16/2011/science-diction-the-origin-of-the-petri-dish.html. [ii] p.219, Julius Richard Petri. “A minor modification of the plating technique of Koch,” 1887. http://202.114.65.51/fzjx/wsw/newindex/wswfzjs/pdf/1887p218.pdf. [iii] Timothy Paustian. “Through the Miscroscope: A Look at All Things Small.” In The Microbial World, 2014. [iv] Charles E. Rosenberg. “The Therapeutic Revolution: Medicine, meaning, and social change in nineteenth-century America.” In M.J. Vogel and C.E. Rosenberg, eds. The Therapeutic Revolution: Essays in the Social History of American Medicine. Pp. 3-25. Philadelphia: University of Pennsylvania Press, 1979. [v] Evelyn Fox Keller. The mirage of a space between nature and nurture. Durham, NC: Duke University Press, 2010. [vi] Sare Ashourzadeh, Azam Agha-Rahimi, and Mohammadali Khalili. “Quality Control of Disposable Object in ART Laboratories Performing Human Sperm Motility Assays.” Journal of Reproductive Infertility 12.2(2011):101-108. M. Nijs, K. Franssen, A. Cox, D. Wissmann, H. Ruis, & W. Ombelet. “Reprotoxicity of intrauterine insemination and in vitro fertilization-embryo transfer disposables and products: a 4-year survey.” Fertility and Sterility 92.2(2009):527–35. [vii] Belle Dumé. Nanodiamond coating for a better Petri dish. In Nanotechweb.org, 2012. [viii] Heather Paxson and Stefan Helmreich. “The Perils and Promises of Microbial Abundance: Novel Natures and Model Ecosystems, from Artisanal Cheese to Alien Seas.” Social Studies of Science 44.2 (2014):165-193. [ix] Hannah Landecker, “Food as exposure: Nutritional epigenetics and the new metabolism.” BioSocieties 6 (2011):167–194. [x] Elizabeth F.S. Roberts. “Assisted Existence: An Ethnography of Being in Ecuador.” Journal of the Royal Anthropolgical Institute 19.3(2013):562-580. [xi] Annemarie Mol. The body multiple: ontology in medical practice. Durham, NC: Duke University Press, 2002. This entry was posted in Disease, history, Purity/defilement, Technology and tagged Julius Richard Petri, petri dish, Robert Koch. Bookmark the permalink.